Months (and months) ago I visited a friend of a friend (I’ll called her Louisa) to purchase some items she wanted to sell. Some were things she had inherited from her grandmother, others from her mother and some had belonged to her husband (now deceased). I didn’t buy everything Louisa had wanted to sell and some things she had originally wanted to sell but changed her mind. In fact on two separate visits she wanted to sell me a red beaded necklace that had belonged to her mother, but each time when I tried to buy it, she couldn’t let it go! And I understand that. Some things are hard to part with. But I did buy quite a few nice bits. One of them was this huge antique brass jelly/jam pan. Louisa told me that the pan had come from Scotland to the U.S. with her grandmother and had been used by her grandmother and mother for making, yes, jams and jellies. Later she repurposed it as a plant holder. These days the iron handle is rusty with some white paint speckles, there is a little corrosion and dirt inside and a few small dings from usage. Some of you might look at this and wonder what possessed me to buy it! Here’s why: I see a humble, honest, sturdy item, attractive in its simplicity. It had a purpose and was used for decades and could still be used today. (Can’t say that about too many things produced in the last 10 years!) This has survived for over 100 years and only needs a little TLC to restore it to its former glory or leave it as is. The only reason I haven’t put it in my store yet is because it’s big (13” tall) and heavy (9 pounds) and I didn’t have a box big enough to handle it. But now I think I do so I can figure out the shipping cost. Actually, that’s not the only reason it isn’t in my store. I rather like the darn thing! This Christmas I put some greens in it and put it by our fireplace and it looked quite nice. In fact there are so many things that would look great in it: pinecones, kindling, magazines, yarn, matchbooks, etc. And if it was cleaned up it could be used for cooking again. But it doesn’t appeal to my husband, so I am finally (and reluctantly) going to add it to my store this week. It’s time! Do you have antiques in your house?? Favorites? I wouldn’t sell that brass pan right away either–I love it! There have been so many things over the years that I bought to sell and instead found a place in my home for them. After awhile, I may end up selling them but some stay. Some of my favorite keepers are vintage radios, fans, toys and signs. You’ll love it. Those fans look awesome and move some serious air! One of my favorite things about buying vintage and antique items for resell is that I can hang onto select items for a time before moving them. 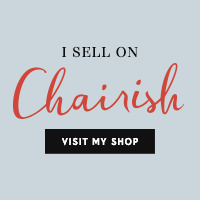 It allows me to afford more of the things I enjoy and when I find something else I can always sell.